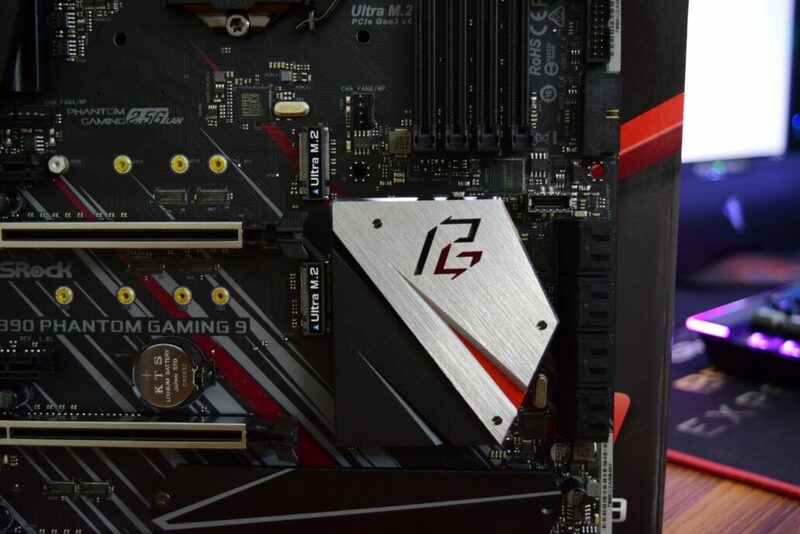 The ASRock Z390 Phantom Gaming 9 is styled in black and silver with red accents across the PCB and PCH cover. 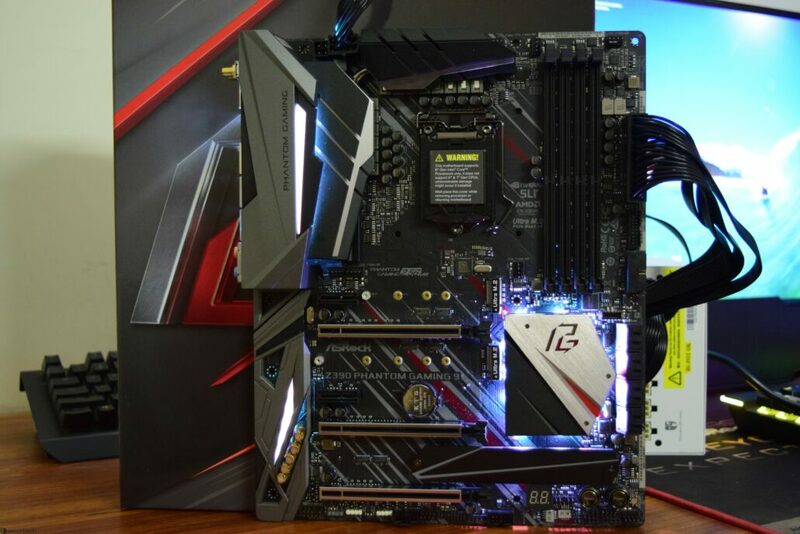 This is a top-tier product that retails at $269 US so expect lots of features packed inside this motherboard. The motherboard comes in the standard ATX form factor. 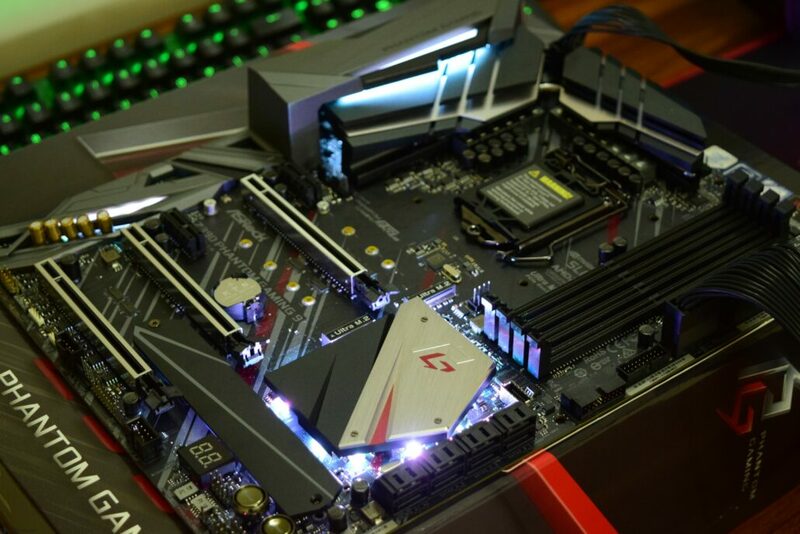 The board uses the LGA 1151 socket to support Intel Core processors. The socket is compatible with Intel’s 8th & 9th Generation core family. 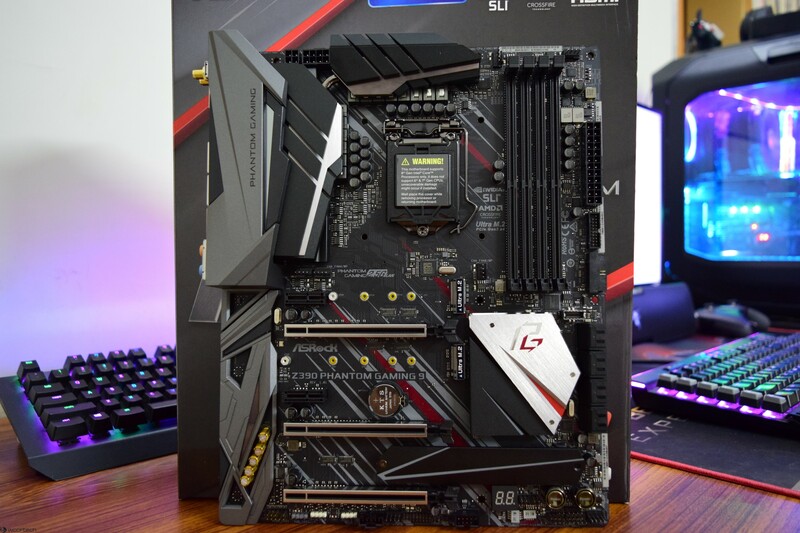 The socket has a protective cover on top of it that points out the exclusivity with Coffee Lake CPUs and refrains users from running an older 6th or 7th generation CPU as they won’t work with these motherboards at all. 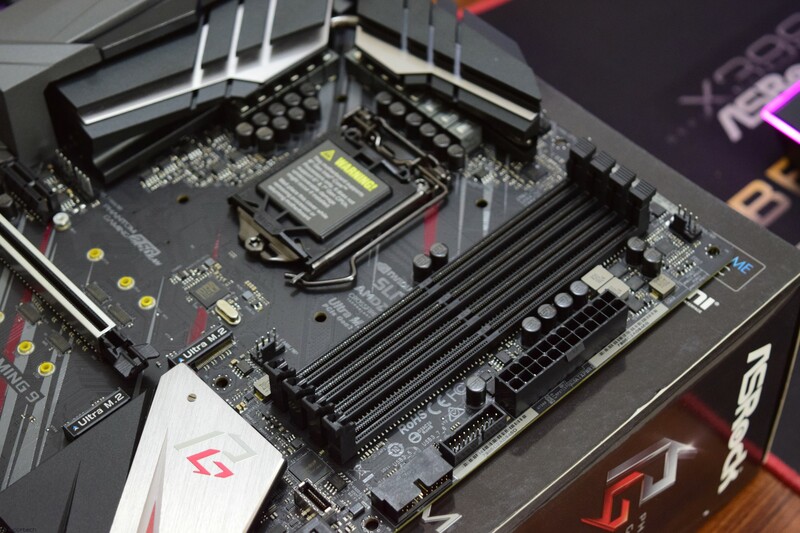 Next to the socket are four DDR4 DIMM slots which can support up to 64 GB dual channel memory. 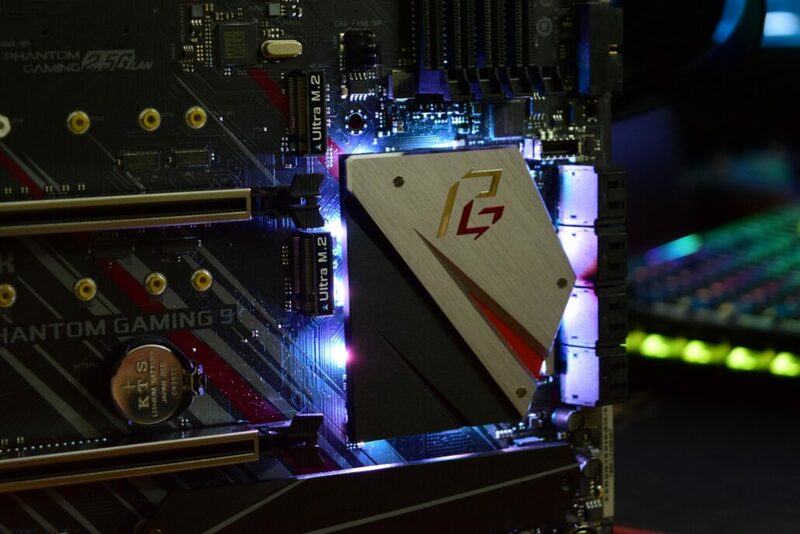 These slots are rated to support XMP profiles up to 4266 MHz (OC Plus). Each slot is labeled, making it easier to install DIMMs in the proper orientation. 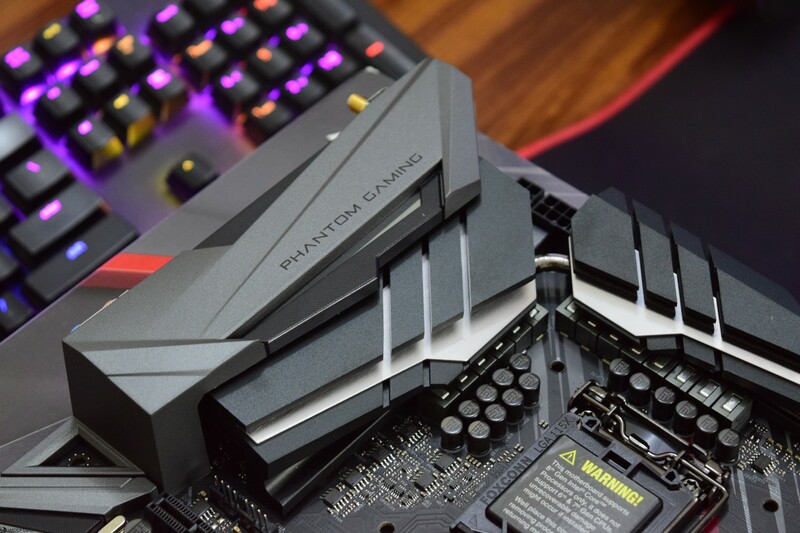 The ASRock Z390 Phantom Gaming 9 packs a 12 phase super alloy power design. 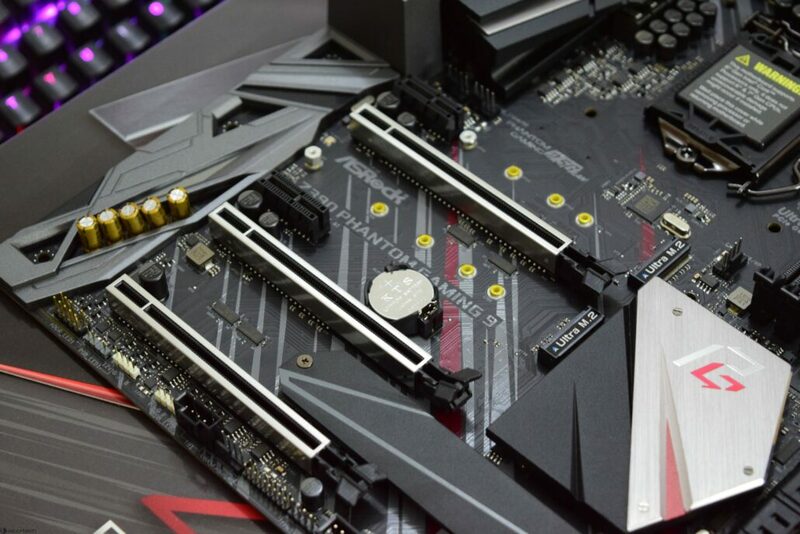 The design is packed with 2 phase power for the DRAM and uses Premium 60A power chokes, Premium Memory Alloy Chokes, Dual-Stack MOSFET (DSM), Combo Caps and Nichicon 12K Blackcaps that deliver an unprecedented amount of stability and overclocking capabilities. 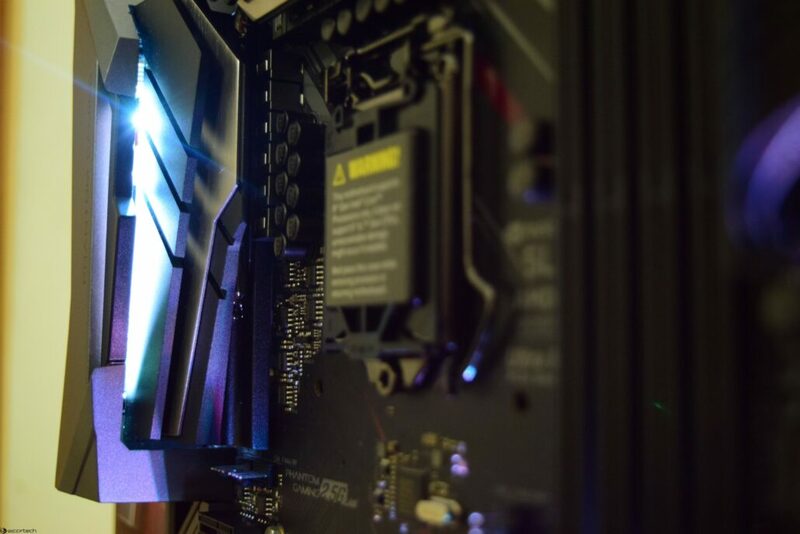 If you look in closely, the heatsink solution comes with heatpipe coolig that runs across the entire length of the dual heatsinks. 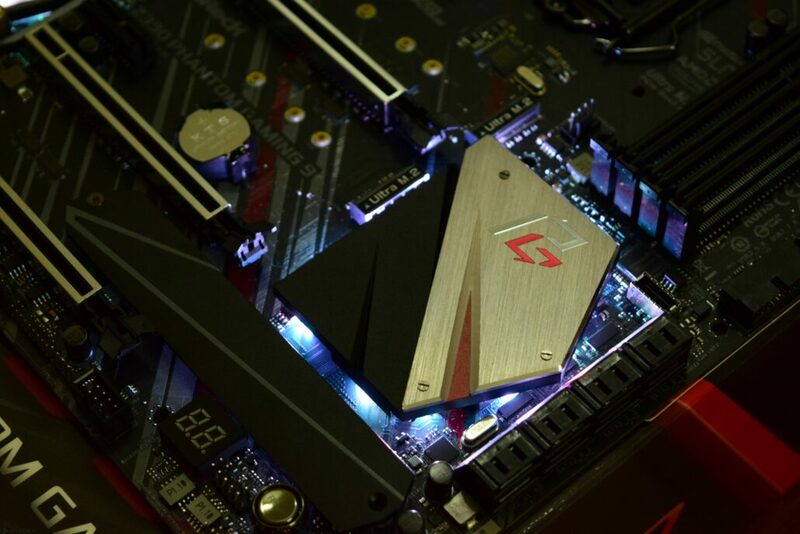 ASRock is also using an aluminum based heatsink under the IO cover which can provide even better thermal operation under load. The CPU is supplied power through an 8+4 pin power connector configuration. 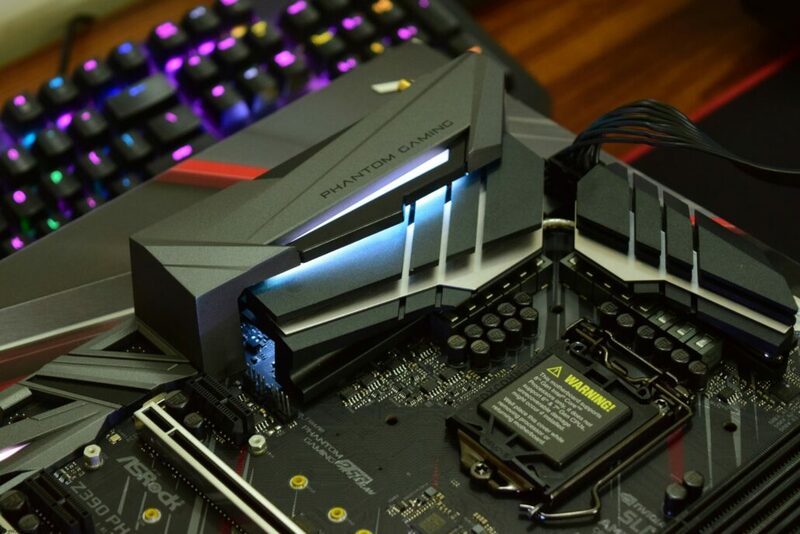 This will feed the CPU with up to 225W of power. 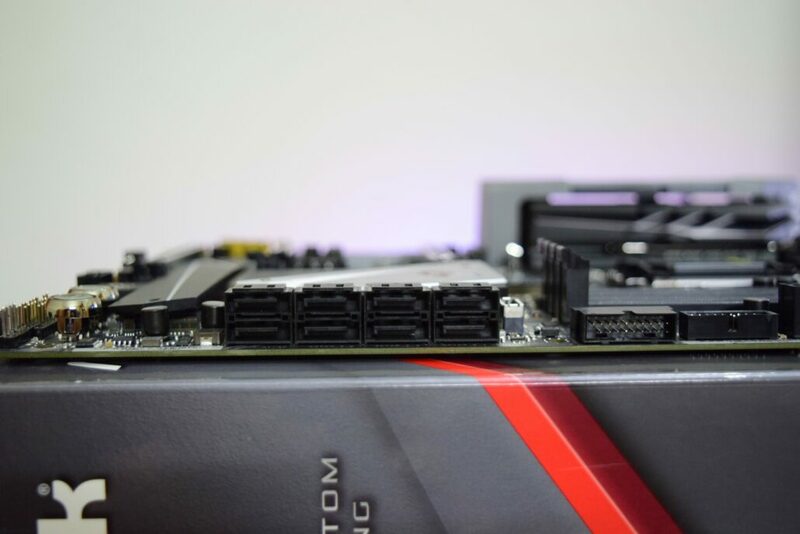 Most Intel CPUs will be shipping with TDPs under 100W but that changes when users overclock since that changes the power limit based on applied voltages and clock speed. Expansion slots include three PCI Express 3.0 x16, two PCI Express 3.0 x1 and three M.2 slots. The board can support three-way multi-GPU (CrossFireX / SLI). The M.2 slots are rated to support NVMe PCIe gen3 x4 and Intel Optane series memory. ASRock is using their PCIe steel slot design on the sides of the expansion slots which provides protection to some extent. It adds more retention and shearing resistance by reinforcing the slots with metal plates. Aside from adding more protection, they do look really sweet. 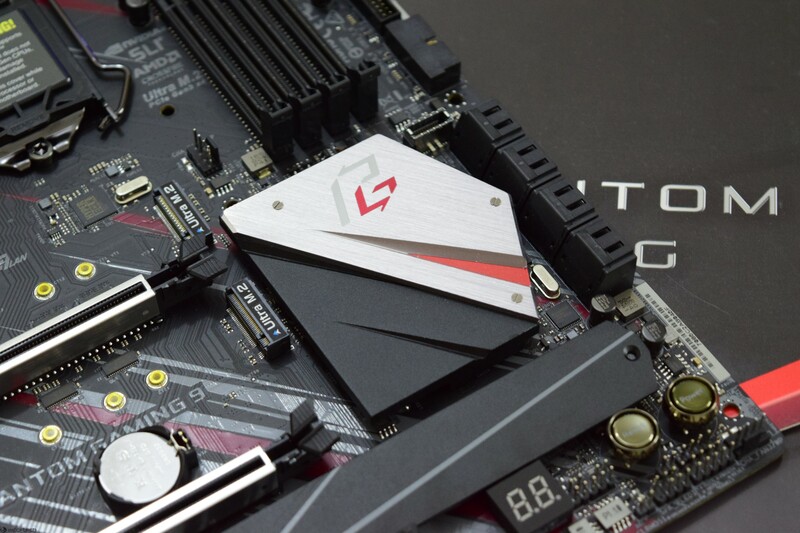 The bottom most M.2 slot features a heatsink that comes with a large metallic plate, acting as a heatsink and further includes a thermal pad that can sustain higher temperatures when storage devices (M.2 SSDs) are stressed for long durations. The PCH is cooled off by a large metallic heatsink which runs next to the SATA ports. 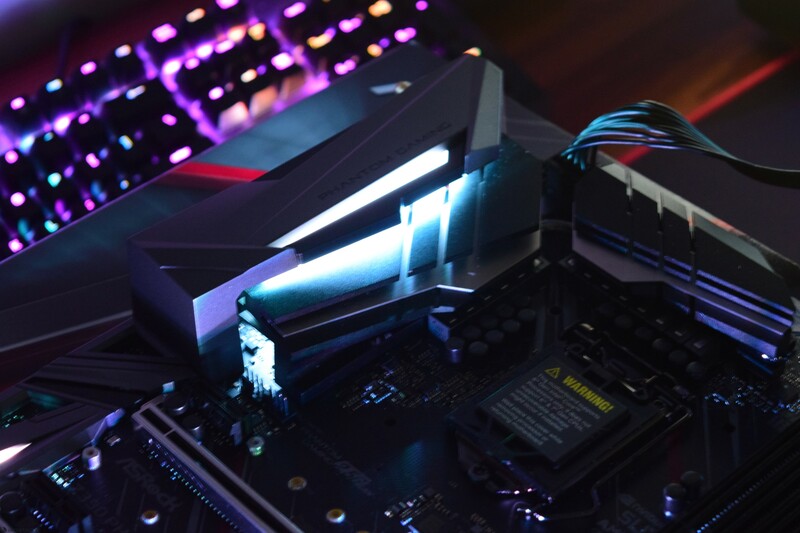 The PCH heatsink has embedded RGB LEDs and provide a good light show for those that are interested in RGBs trend. 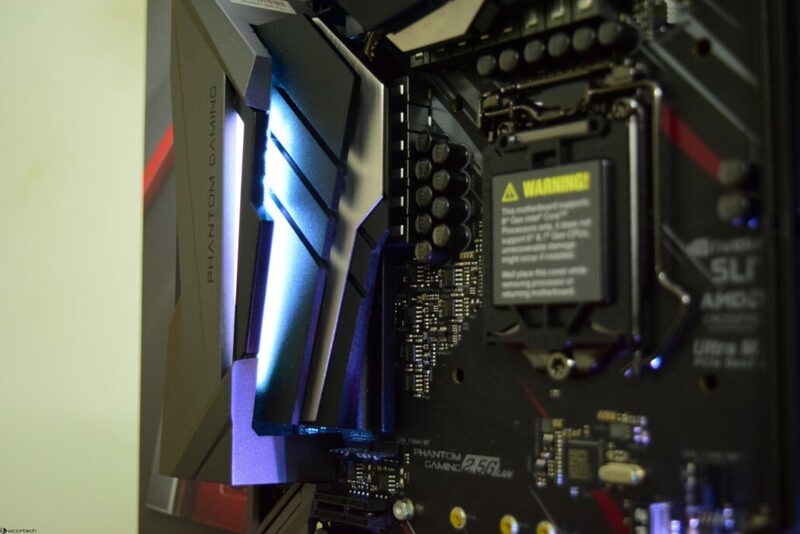 You can also turn off the LEDs entirely through ASRock’s bundled software if you are not a fan of such LEDs. 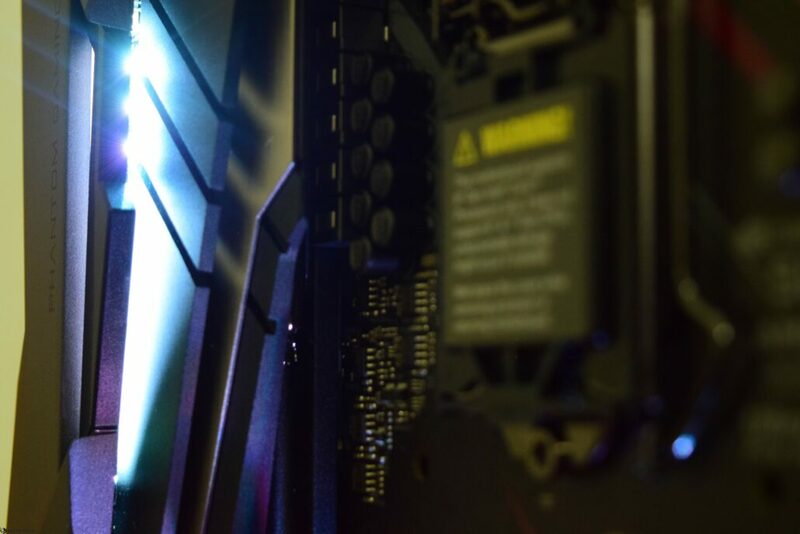 Storage options include eight SATA III ports rated to operate at 6 GB/s. These can support eight different storage devices at once. 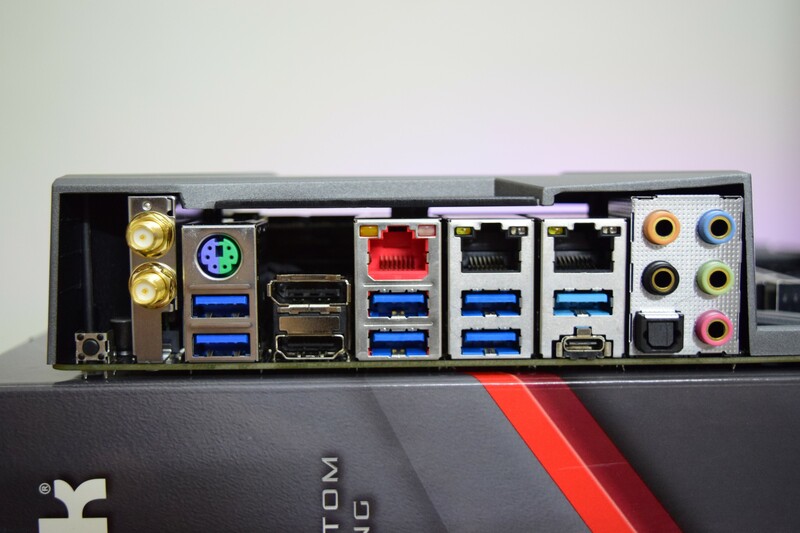 There’s also a right angled USB 3.0 front panel connector. Many fan headers and jumpers can be found beneath the storage ports. 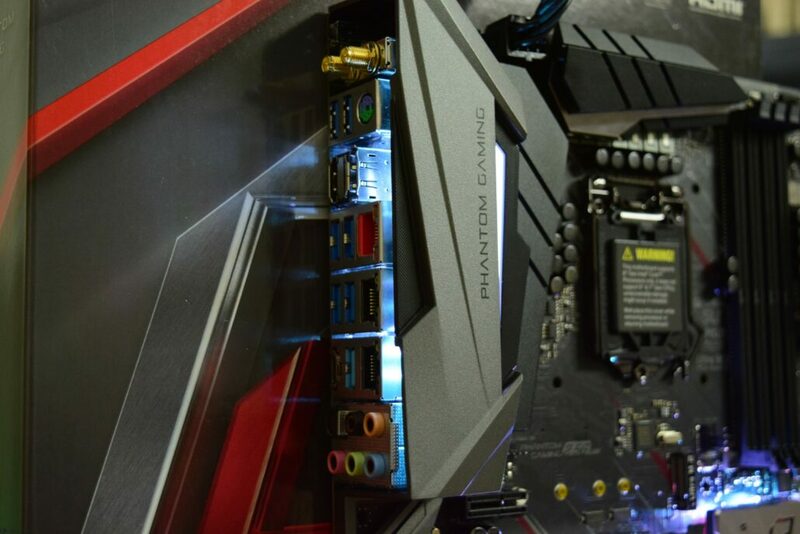 ASRock is using their Sound Blaster Cinema 5 audio system for audio which is a combination of hardware, software audio solutions. 7.1 CH HD audio with the latest Realtek ALC1220 audio codec, individual PCB layers for R/L audio channel, 120dB SNR DAC. In addition to that, there’s also a NE5532 headset amplifier for front panel audio connector that supports up to 600 Ohm headsets. 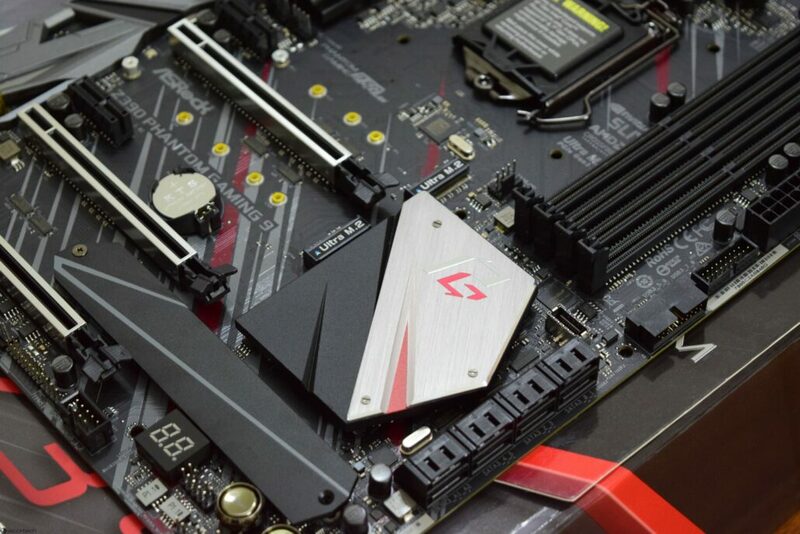 ASRock has placed two very interesting, gold colored buttons at the bottom right-hand corner of the board. 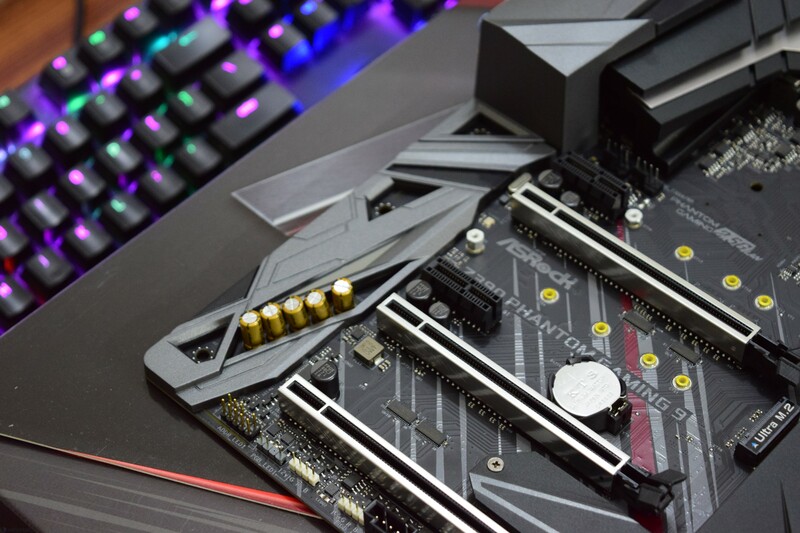 The purpose of these switches is to allow users to easily Power or Reset the board in overclocking and system tuning cases. 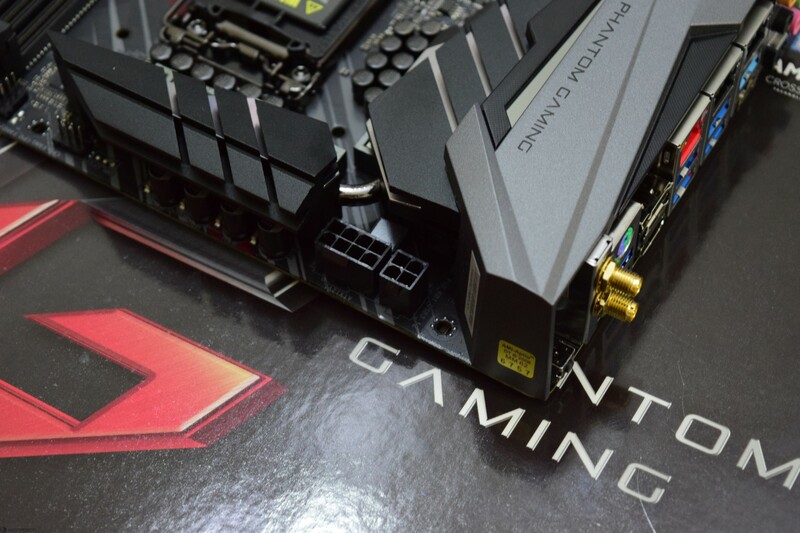 A bunch of other connectors for chassis power, RGB and fan headers can be spotted next to them. 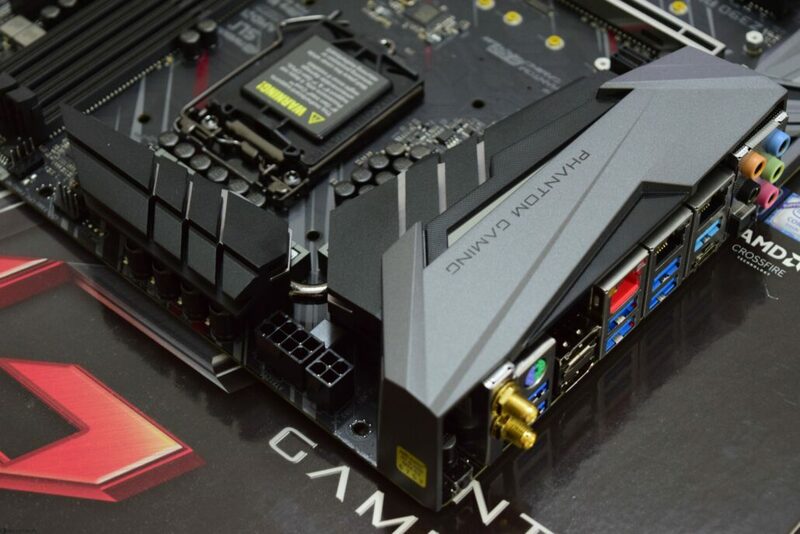 The full list of connectors on the motherboard is listed as follows. 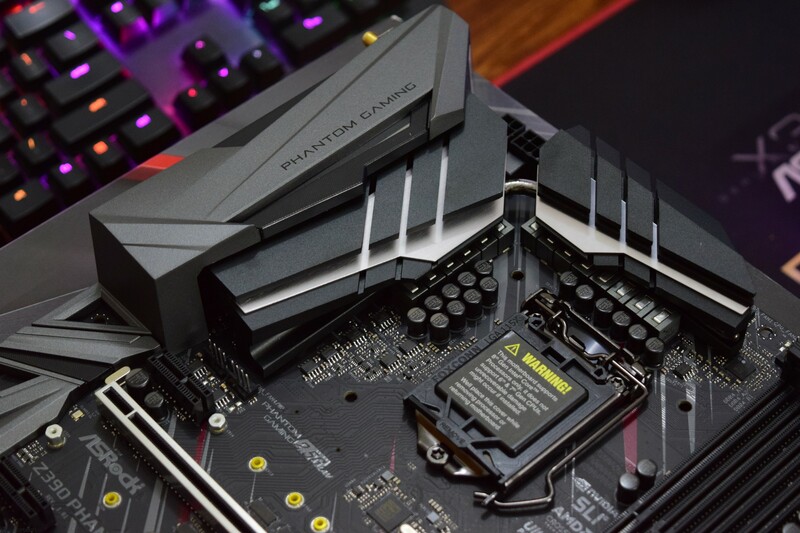 ASRock is using the Intel 802.11ac WiFi Module to power wireless connectivity such as 802.11ac WiFi (2.4G / 5G WiFi) and Bluetooth 5.0. In terms of Ethernet, there are dual Intel Gigabit Ethernet LAN ports and a 2.5 Gb/s LAN (Dragon RTL8125AG) port which means networking on this board is going to be really impressive. Finally, we have the I/O panel which includes the Wi-Fi 802.11 a/b/g/n/ac module, PS/2 port, HDMI, Display Port, Dual Intel Gigabit Ethernet LAN ports, a single 2.5G Ethernet LAN port, 4 USB 3.1 Gen 1 ports, four USB 3.1 Gen 2 ports (Type-A + Type-C), a clear CMOS button and a 7.1 channel audio jack. 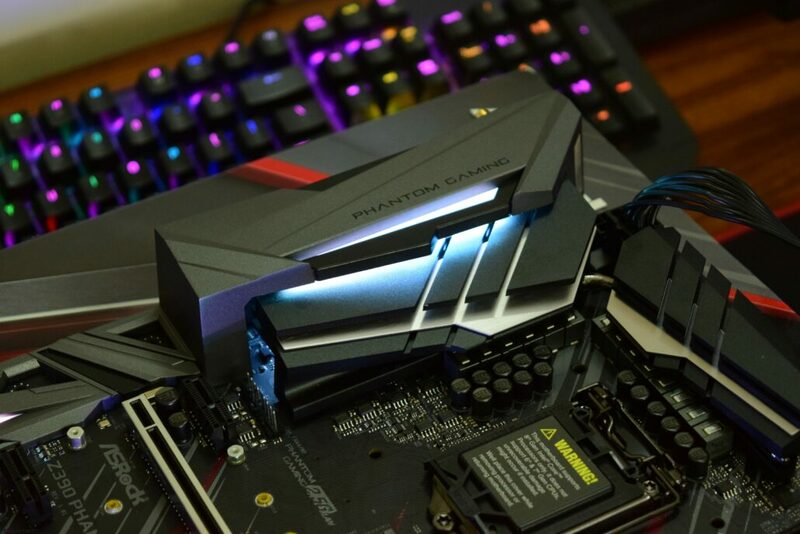 ASRock is using their Polychrome RGB and Polychrome Sync technologies to power the lighting system on the Z390 Phantom Gaming 9. 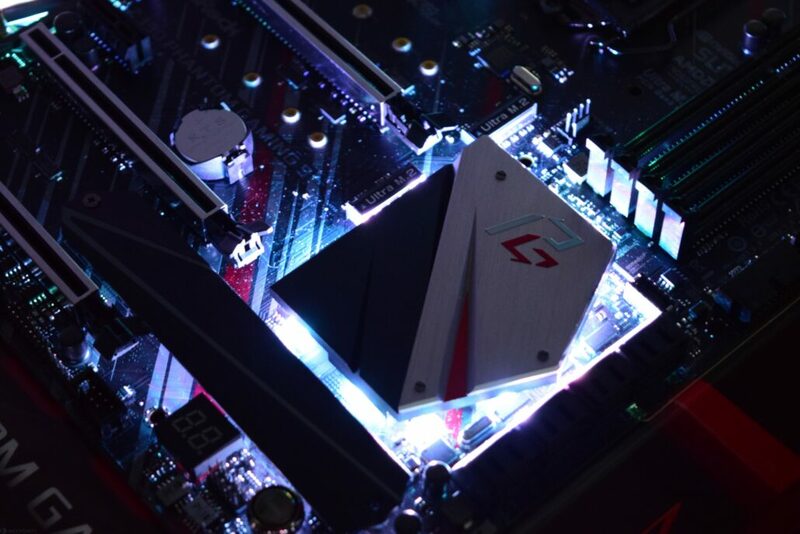 There’s a range of customization available through the app which can be downloaded directly from ASRock’s official webpage.